That's right! I believe Moon Knight was my last Pick of the Week and now it's my current Pick of the Week too. We'll have to see how long it can keep up this streak. 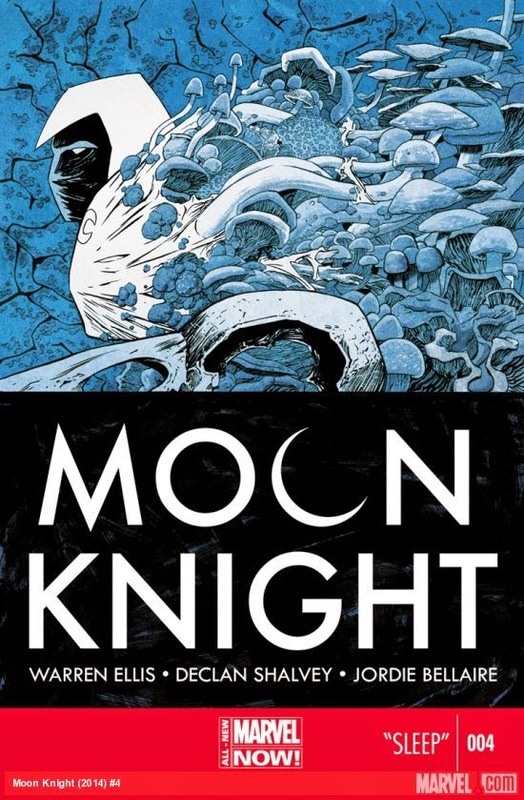 Moon Knight is trying to solve this mystery that has to do with a group of people who are all experiencing the same dream. It's causing them to go completely mad. So, Moon Knight takes a very direct approach and decides the best way to go about finding out more information is to put himself into the same experience as the other people who are having the singular dream. The artwork is really fantastic in the dream sequence. The contrast is really nice compared to the previous scenes which had a generic vibe to them. Not that the art was bad in those scenes but there was nothing dynamic about them. It was pretty straight-forward storytelling and that worked really well because the dream-state is such a cool and creative place. It connects so well with the plot, too. It's not like a random, crazy environment with no vision or direction. The imagery and the details are like bread-crumbs for the big revelation at the end of the story. I love details like that. It's the art and the script working hand in hand to tell the story together. I'm enjoying seeing Moon Knight in these various types of situations in each issue and seeing how adaptive he can be. He's a fascinating character. I think another interesting thing to note is how the issues aren't revolved around so much of his personal information and back-story. His portrayal is filled with mystery. It's great stuff and I'm looking forward to the next issue.